I’ve had a great time sharing pieces of our recent New York trip with you, and I’m wrapping the series up today with An Autumn Adventure in New York. We’ve visited New York in June, August, and October. Although the city is amazing any time of year, I have to admit that I’m especially partial to Fall. The weather is crisp, which puts a spring in everyone’s step…and it lends itself to lots of outdoor exploring! 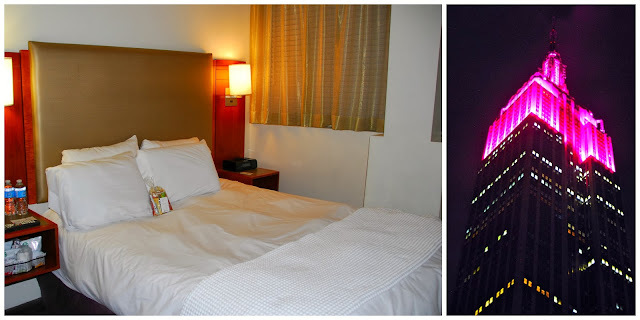 We arrived at La Guardia late on a Thursday evening and hopped in a cab to head to Hotel 373. This boutique property is located across the street from the Empire State Building, making it very convenient to hop an elevator to its observatory high above the city. I can vouch from personal experience that kissing your sweetheart as the city lights twinkle below is a memory you’ll never forget! But…I digress. Hotel 373 offers travelers a great value. The rooms are compact, but they offer a ton of fabulous amenities, including: in-room WiFi, comfy beds with luxurious linens, large bathrooms with Philosophy toiletries, and even an onsite Starbucks. Our room offered a gorgeous view of the Empire State Building too! As an added bonus, if you book your room via Hotel 373’s website, they’ll also include breakfast at the adjacent deli. We loved walking next door for delicious made-to-order omelets and French toast before a day of exploring the city. 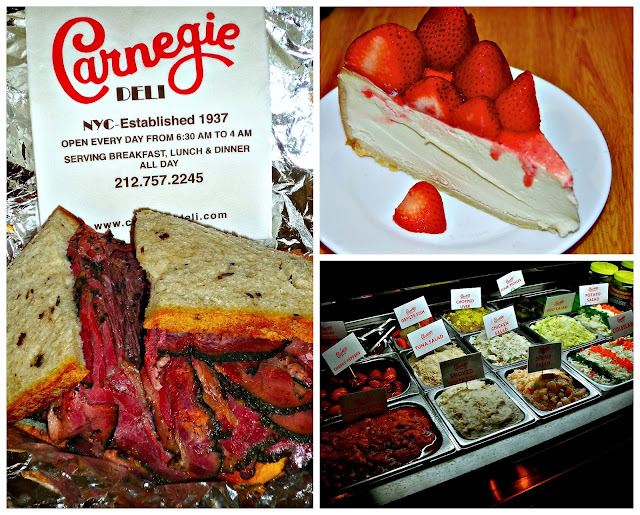 New York is known for its amazing delis, and one of the most iconic examples is Carnegie Deli. They're legendary for good reason: they offer huge portions of delicious food and a convenient Midtown location. When we arrived for lunch, the line of hungry patrons was literally out the door and around the corner. We chatted with Director of Marketing Sarri Harper while we split a HUGE pastrami sandwich and a slice of their ultra-rich New York cheesecake topped with fresh strawberries. Sarri's family has owned Carnegie Deli since 1976, when her grandfather took over the restaurant. She was a fabulous hostess, and the food was absolutely amazing. You haven’t really eaten pastrami until you’ve enjoyed a pastrami sandwich at Carnegie Deli, and the cheesecake is some of the best you’ll ever taste. They're open daily from 600 a.m. to 430 a.m., so you can satisfy your cravings day or night. Needless to say, we left Carnegie Deli stuffed and satisfied! Although we were pretty full at that point, we somehow had a bit of space for some authentic French macarons. We first visited Laduree during a visit to New York this Spring. We were immediately smitten with their amazing flown-in-from-Paris macarons. We knew we had to go back to try some of their seasonal Fall flavors. We arrived at their stylish Upper East Side location and were warmly greeted with a silver tray full of brightly colored macarons to sample. This is pretty much how I imagine Heaven might be: full of delicious cookies! Laduree's delicate macarons literally melt in your mouth, and they feature natural flavors. All the macarons we tasted were fabulous, but our favorites were the mint, gingerbread, and rose petal. We enjoyed a few of our macarons in the store, and they graciously packed the rest of them into a gorgeous box for us to take with us to enjoy later that evening. Which we did. New York is also known for amazing and lavish Broadway productions. You'll find everything from dramas to musicals. On a previous trip, we really enjoyed seeing Wicked…so we wanted to include a musical on this visit. 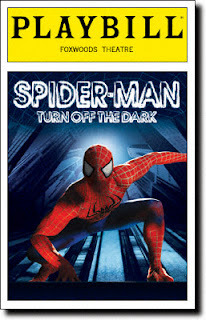 We’re huge U2 fans, so we were very curious about Spider-Man: Turn Off the Dark, which they wrote the musical score for. Despite a rough start a couple of years ago, the show has been playing to packed houses of eager fans since. We had great seats on the floor level of the historic and beautiful Foxwoods Theater on a busy Saturday night. Bottom line: we had a total blast at the show! The musical is fun for kids of all ages, and the performers are incredibly talented...and acrobatic. If you want to see this show, you’ll have to act fast, though. It was recently announced that Spider-Man: Turn Off the Dark will end its Broadway run in early January, after a 2.5-year run. After leaving Broadway, the show will head to Las Vegas. After the show, we walked a few blocks over to Restaurant Thalia to enjoy a post-show dinner. Thalia is a great restaurant for a late dinner, because they’re open until midnight. on weekends. We enjoyed lunch at Thalia during our trip this Spring, so we were excited to check out their dinner menu. We began our meal with shared starters: Iceberg Salad and the gorgeous and tasty Burrata and Flor du Latte Duet. The salad was topped with smoky Serrano ham, grated ricotta salata cheese and a tangy-smoky bacon dressing. This salad was bursting with flavor! The burrata platter included prosciutto de parma, roasted red peppers, pesto and a tangy-sweet balsamic reduction. The combination of flavors and textures on this plate was fantastic, and the house-made burrata was creamy and rich. For vegetarians, this dish could easily be made into an entree with the addition of Thalia's crusty house-made bread. For my entree, I selected Grilled Mayan Prawns, which were served over luscious sweet corn risotto and crab-stuffed mushrooms. 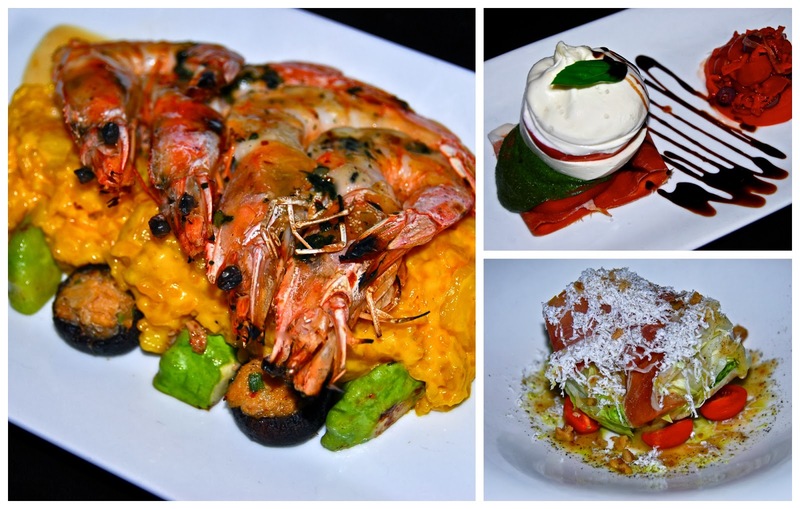 The sweetness of the risotto paired perfectly with the seasoned grilled shrimp. Perfection! While we waited for Michael's entree, the chef sent out a bonus appetizer of smoked salmon, whipped goat cheese and basil-infused oil...serve with crispy handmade waffle chips. It was fresh and light, with a slight smoky flavor from the salmon. Then, Michael's entree arrived: Smoked Grilled Pork Chop. This bone-in double cut chop was topped with a gruyere and leek crust and served with Brussels sprouts, roasted potato wedges and an apple cider sauce. This was the perfect entree for a crisp Fall evening. The chop was grilled perfectly, and the cheesy crust provided an extra layer of flavor. The sweet-tart-earthy cider sauce was the perfect accent. We opted to share dessert. We're both citrus lovers, so it took a nanosecond to agree on Warm Lemon Souffle with Fresh Raspberries. It came to the table warm, light as air, and bursting with the sweet-tart lemon flavor we love. If you find yourself in the Theater District, check out Thalia! 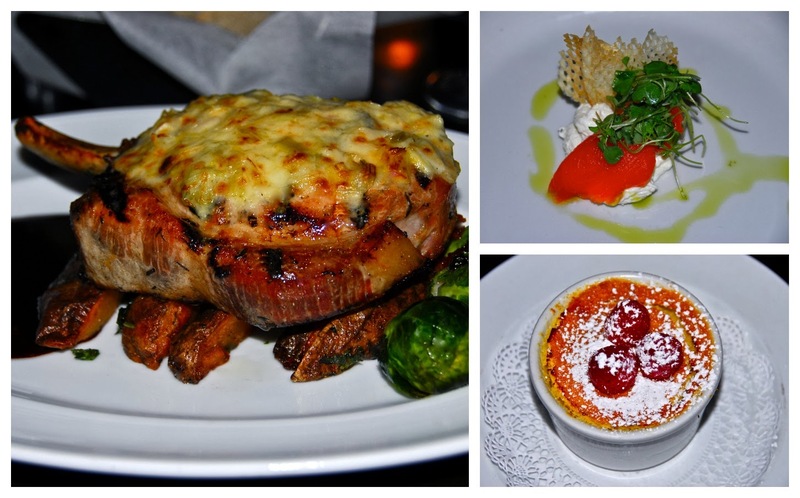 They offer a great prix fixe lunch menu, as well as a popular Happy Hour and $1 oysters from 700 p.m. to close nightly. For the second leg of our trip, we stayed at Hotel Elysee, located in the Midtown East section of the city. It’s part of the four-property Library Hotel Collection...and it's consistently named one of the most romantic hotels in New York! The atmosphere is inviting and relaxed...the perfect respite from the hustle and bustle of the city. Elysee's location is convenient to many popular Midtown attractions, as well as Madison Avenue shopping. Our room was a mini suite that featured a huge marble bathroom, an entryway that included a convenient writing desk, and a beautiful bedroom with a comfy sitting area. We had plenty of room to stretch out, and the soothing décor made Hotel Elysee the perfect retreat from the hustle and bustle of the city. Hotel Elysee offers guests a wide range of complimentary amenities, including in-room WiFi, a delicious expanded continental breakfast, an afternoon Wine Hour with hors d'oeuvres, and a convenient Business Center. New York's iconic Monkey Bar is conveniently located adjacent to the hotel, and Elysee offers a lobby entrance for its guests. Whatever we needed, the friendly staff made sure that we had it. The helpful front desk staff expertly assisted us with navigating the quickest walking route to several of our destinations nearby the hotel. 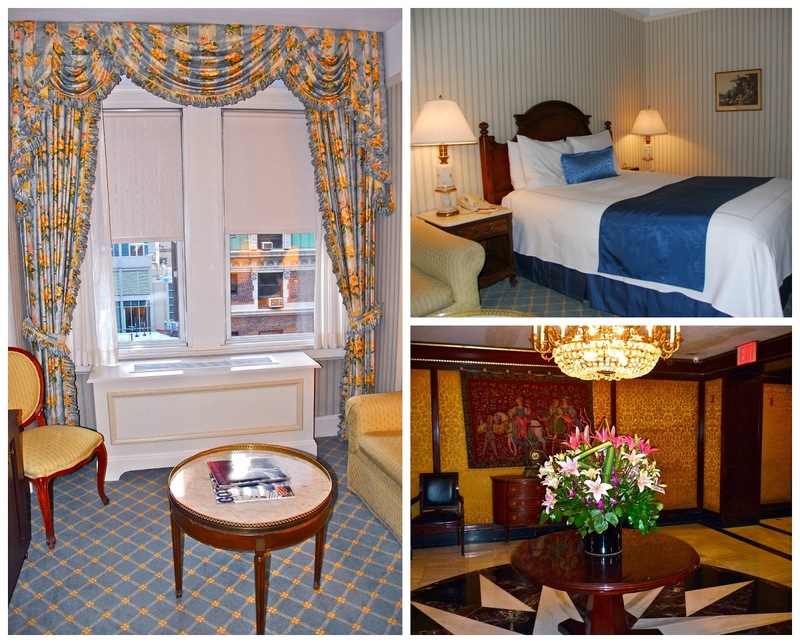 We're sticklers for good customer service, and Hotel Elysee sets the bar pretty high for guest satisfaction! Once we dropped our bags in the room and settled in a bit, our first stop was the Museum of Modern Art (MoMA). I’ve wanted to visit this museum for ages, but we never seemed to make it by on previous trips. This time, we finally made it --thanks to the New York Explorer Pass. This card provided us admission to three popular New York attractions, and we even got to skip the line! I can’t recommend this card highly enough. We had a wide range of tours and attractions to choose from – museums, bus tours, iconic city landmarks, etc. Even experienced New York visitors like us found tons of great options to choose from. We had a fantastic time at the MoMA, seeing famous pieces by some of our favorite artists. It was amazing to see works by Monet, Jackson Pollock, Andy Warhol, Van Gogh, and Picasso up close. We love visiting art museums when we travel, and we found MoMA to be one of the easiest to navigate because of it's grid-like layout. I highly recommend an afternoon visit to MoMA for anyone who loves fine art. We have eclectic tastes…in food and in entertainment. 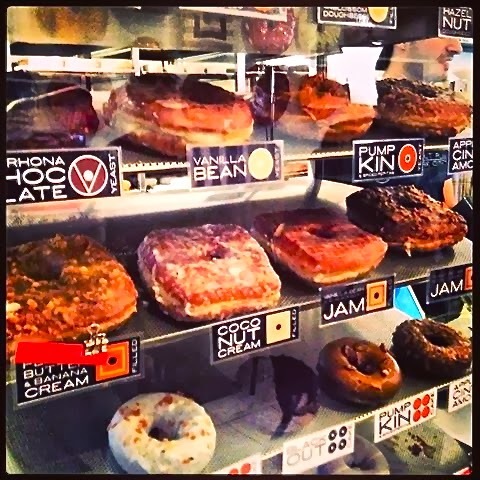 We started out the Monday of our trip with a visit to Chelsea for our favorite doughnuts on the planet: Doughnut Plant. For us, Doughnut Plant is a must for our NY itinerary. There’s nothing better than starting the day with a cup of their exotic chai latte and some of their seasonal doughnuts. This trip, we sampled some great Fall flavors, including: Pumpkin Cake, Pumpkin-Filled Doughseed, Pumpkin Yeast, Apple Spice Cake and Chocolate-Hazelnut Doughseed We also had to try a few of our standby’s: Carrot Cake, Tres Leche Cake and a Texas-sized cinnamon roll. We walked to Madison Square Park with our box 'o doughnuts and enjoyed a late breakfast while enjoying a cool breeze and a bit of people watching. We had tickets to attend a taping of The Late Show with David Letterman that afternoon, so we headed back to Midtown. We checked in at the Ed Sullivan Theater and were told to come back in an hour to line up to be seated. Want to attend a taping next time you’re in town? Here’s the scoop: go to the show’s online submission form and select the dates you’ll be in town to attend. A few days before, someone from the show’s staff will call you. To win a pair of tickets, you have to answer a trivia question. If you watch the show even sporadically, you’ll be able to answer the simple question. The show tapes M-Th at 430, and the taping lasts approximately an hour. The day we were there, the guests were Ray Romano and James Franco. We had great seats on the lower leavel of the theater, about five rows back. This was our third time to attend a taping, and it’s always a good time. Make sure to set your DVR so you can look for yourself in the audience when you get back home! After the taping was finished, we headed to an early dinner at Bread & Tulips, an upscale casual Italian eatery adjacent to Hotel Giraffe in the Flatiron District. The restaurant features an inviting atmosphere and delicious food. We started out with a trio of antipasti: Homemade Organic Ricotta, Meatballs in San Marzano Sauce and Grilled Octopus. All three were expertly prepared and so delicious. The homemade ricotta was creamy and rich. Topped with olive oil, sea salt and herbs, it was perfect spread on toasted bread. The meatballs are some of the best I've ever tasted. They were juicy and melt-in-your-mouth tender. I have to admit that I'm normally not a huge fan of octopus, but perhaps I've never had it cooked properly before. This octopus was smoky, tender and sweet. After the warmup act, it was time to enjoy our entrees and dessert. 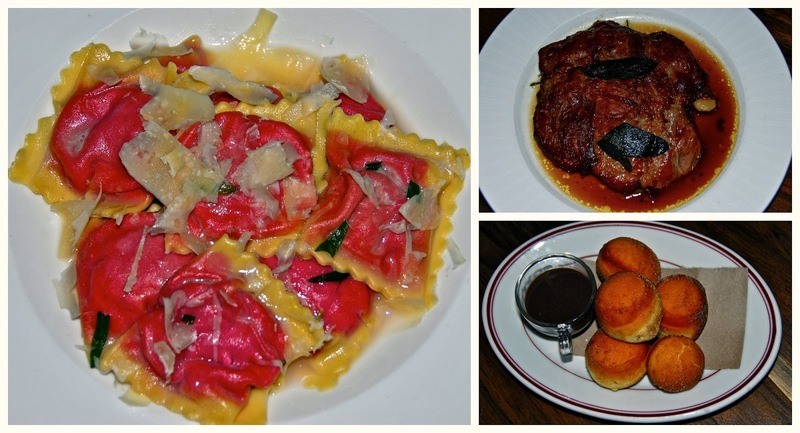 We shared two entrees: gorgeous Roasted Beet & Goat Cheese Ravioli and Veal Saltimbocca. The ravioli filling was creamy and slightly sweet, which worked nice with the fresh tarragon butter sauce that accompanied it. The saltimbocca was savory and delicious. This dish featured thinly pounded veal that was cooked and topped with pearl onions, pearl onions and natural jus. For dessert, we shared Bomboloni with Dark Chocolate Dipping Sauce. The fried doughnuts were filled with Bavarian cream, which worked well with the slightly bitter chocolate dipping sauce. It was the perfect way to end our meal. It was our last evening in town, but we were worn out from our hectic itinerary and decided to spend the evening relaxing in our peaceful room at the Elysee rather than go out that night. We packed our bags and watched Halloween movies on AMC and chilled out in our comfy bed! Before we knew it, it was our last day in town. We quickly realized that we only had until late afternoon to cram in a bit more fun. We stored our bags at the Elysee and headed out for a last bit of adventure. Since Radio City Music Hall was located so close to Hotel Elysee, we walked over to take the tour using our handy Explorer Pass. The tour was very informative, and Radio City Music Hall is absolutely gorgeous inside! Built in the 1920s, it’s a great example of art deco architecture. 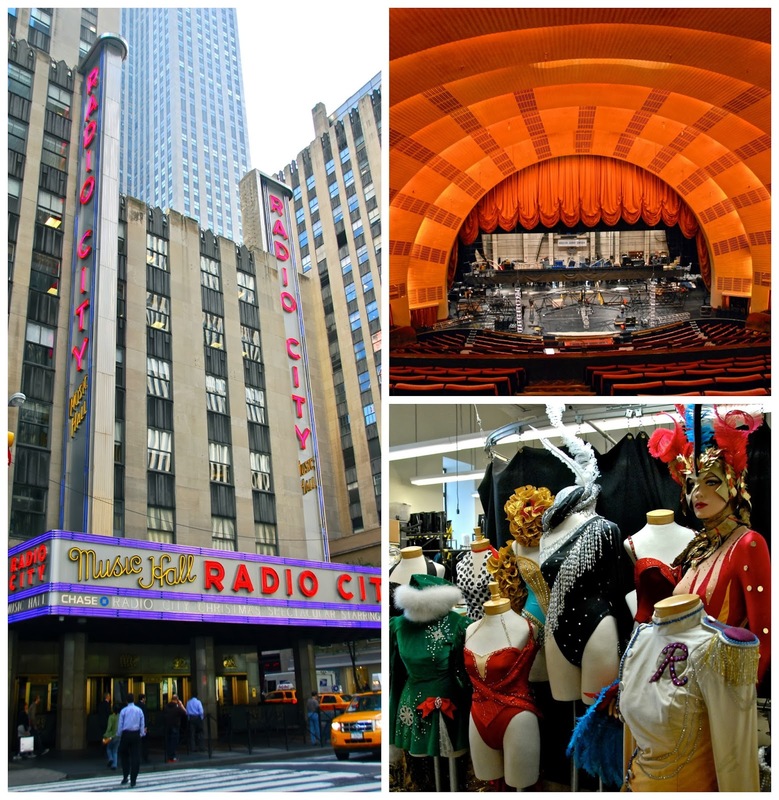 We toured the lobby, sat down inside the gorgeous theater and even went behind the scenes to learn about the Rockettes. We had a great time and can’t wait to come back and attend a show so we can hear the theater’s acoustics. I love that New York embraces and lovingly maintains its older buildings. After our tour, we hopped into a cab and made our way to The Plaza Hotel to grab lunch at its popular food hall. The Plaza Food Hall offers diners tons of great selections – everything from baked goods to frozen yogurt and great sandwiches. Being Texans, we quickly zeroed in on something we can get here at home: lobster rolls and clam chowder. Luke's Lobster offers a great menu that includes lobster rolls, crab rolls, shrimp rolls and creamy clam chowder. The food was amazing…and a good value for the quality and amount of food you get. This was such a great treat for us! The roll was stuffed full of lobster chunks, and the chowder was creamy and rich. By then, it was just about time to head to the airport. We stopped in a gift shop to pick up a couple of souvies, then headed back to the Elysee to claim our bags and hop into a cab. What are the odds that our cab driver was one that we had ridden with earlier in our trip?!?!? There are a gazillion taxis in New York, so the odds have to be pretty high. Before we knew it, we were at La Guardia to make the trek back home to Texas. Until next time, New York. Disclosure: Hotel 373 and Hotel Elysee provided us with a discounted media rate and/or complimentary lodging during out stay. In addition, the restaurants featured provided us with the food featured. We also received complimentary tickets to Spider-Man: Turn Off the Dark, as well as New York Explorer Passes to facilitate inclusion in this article. We received no further compensation, and all opinions expressed are my own. All photographs are copyright Michael K. Garcia and may not be copied or otherwise used without prior permission.